The economic and social realities of the art world as it exists can often be a source of frustration for artists, but what might an alternative model look like? 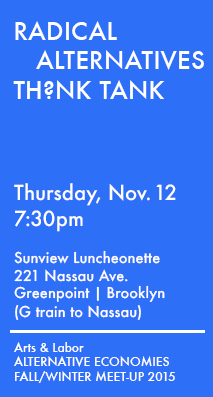 In this workshop we’ll discuss the things we like and things we don’t like about the current art world. Then we’ll learn about various alternative models and discuss amongst ourselves how they can be applied to or replace the current system. Join us this Friday & Saturday for the first edition release of What Do We Do Now? 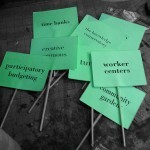 Arts & Labor’s Alternative Economies Resource Guide. Input for subsequent editions is welcome; we plan to update periodically! 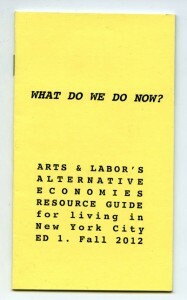 Over the course of several months in 2012, members of Arts & Labor’s Alternative Economies group decided to research and compile a list of alternative resources for living in New York. This resource guide contains examples of barter for health care programs, times banks, workers coops, community social services, alternative transportation advocates, and more. We are now ready to distribute the resource guide throughout the city at various events and with friends whose work forms part of building an alternative economy in New York City.